Thanks to a tuition freeze, full-time students at Virginia Wesleyan University will pay the same rate of tuition in the 2018-19 academic year as they did this year. 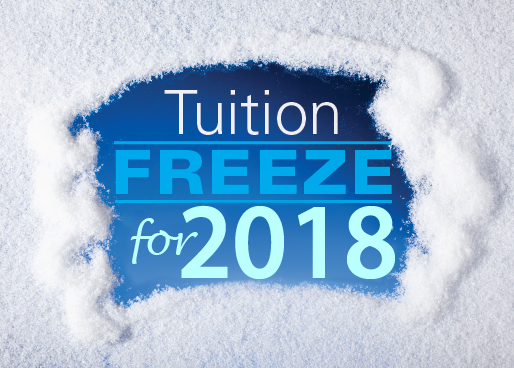 During the freeze, tuition will remain at $36,010. According to a report from the State Council for Higher Education for Virginia, there is a predicted average increase of 5.4% or $422 for four-year institutions. The freeze will exempt incoming and current students from this increase, but not from other mandatory fees such as room and board, meal plans and technology fees. The Virginia Wesleyan University administration shared the word about the tuition freeze through many forms of social media, including Facebook and Instagram. The university’s website has also made a formal announcement. You may have also seen it mentioned in one of President Scott D. Miller’s daily nota bene. “I saw the news about the tuition freeze on Twitter,” junior Alizae Dollins said. Sophomore Jayla Cross said she read about the tuition freeze in an email. Some are unsure about the relevance of the freeze, perhaps due in part to the fact that very little has been shared about it. “I don’t really know what this means or how it’s going to impact my life,” said freshman Shannon Harris. Not much is known about next year’s tuition freeze other than the obvious statement that tuition for the next academic year is going to remain the same as this current year. There has been no information released regarding whether other expenses, such as room and board or meal plans, will also be price-locked or if they will increase. According to an article published in “The Wesleyan Review,” Virginia Wesleyan hasn’t had a tuition freeze for 20 years. The last time was in 1998.